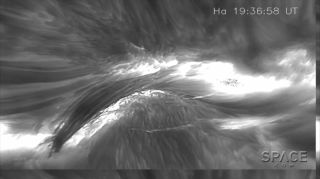 The1.6m New Solar Telescope at the ground-based Big Bear Solar Observatory has captured unprecedented images of a twisting solar magnetic structure as it touches off ribbons of flares. Twisted ropes of hot plasma and light on the surface of the sun that writhe like snakes can now be seen in high definition. These solar flux ropes — also known as coronal loops or solar prominences — can be seen in stunning detail thanks to new observations taken by the 1.6m New Solar Telescope at the ground-based Big Bear Solar Observatory in California. You can watch a high-definition video of the ropes on Space.com. The ropes are created by invisible magnetic fields, which can be seen when visible material is pulled along them. A model showing the magnetic field structure of the solar flux ropes. In the new video, the tubelike form of the solar-flux rope can be seen forming close to the sun's surface, with each end dipping down below. Suddenly, the rope brightens, as if fire had been injected into its core. Its strands twist tighter together, and the rope pushes away from the surface, creating a larger, fiery loop. "These results provide a first opportunity to witness the detailed structure and evolution of flux ropes in the low solar atmosphere," the authors write in the new paper describing the research, which appeared in the April 28 issue of the journal Nature Communications. These solar-flux loops have been observed exploding off the sun for years. NASA's Solar Dynamics Observatory and a fleet of other orbiting instruments have provided stunning views of the surface of the sun, and the chaotic things that happen there. The evolution of a solar flux rope, seen in high definition. In the last three or four years, scientists have made large strides in connecting the formation of solar ropes with explosive belches of material called coronal mass ejections. These solar explosions occur near the surface of the sun and send showers of plasma and high-energy particles out into space (these are known as solar storms). If those particles head in the direction of Earth, they can damage satellites or send surges of electricity through power grids on the ground. If scientists can establish the link between the appearance of these solar-flux ropes and the ejection of solar material, they might be able to establish an early warning system for Earth. With enough lead time, it would be possible to protect many satellites and power grids from damage that these solar storms can cause.